All sinks are made from 18/10 alloy. The 18% of chrome content provides durability, maximum protection against rust and a beautiful satin finish. The 10% of nickel content provides excellent strength and harness. Sinks are Canadian designed and have the cUPC certification. 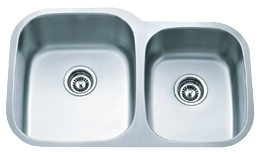 This double undermount stainless steel equal bowl sink was made unsing premium 304 Stainless steel 18/10 material. This undermount 60/40 sink brings elegance to any modern or traditional kitchen. It is made using premium 304 18/10 stainless steel material.